Qing dynasty (1644–1911). The Qing rulers were Manchu, not Han, and were themselves a minority in China. The Qing dynasty witnessed five Muslim rebellions. The first and last rebellions were caused by sectarian infighting between rival Sufi Muslim orders. When the Qing dynasty invaded the Ming dynasty in 1644, Muslim Ming loyalists in Gansu led by Muslim leaders Milayin and Ding Guodong led a revolt in 1646 against the Qing during the Milayin rebellion in order to drive the Qing out and restore the Ming Prince of Yanchang Zhu Sichuan to the throne as the emperor. The Muslim Ming loyalists were supported by Hami's Sultan Sa'id Baba and his son Prince Turumtay. The Muslim Ming loyalists were joined by Tibetans and Han Chinese in the revolt. After fierce fighting, and negotiations, a peace agreement was agreed on in 1649, and Milayan and Ding nominally pledged alleigance to the Qing and were given ranks as members of the Qing military. When other Ming loyalists in southern China made a resurgence and the Qing were forced to withdraw their forces from Gansu to fight them, Milayan and Ding once again took up arms and rebelled against the Qing. The Muslim Ming loyalists were then crushed by the Qing with 100,000 of them, including Milayin, Ding Guodong, and Turumtay killed in battle. 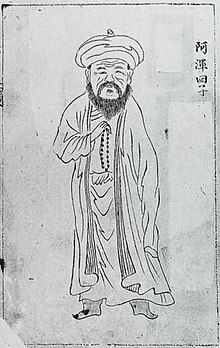 The Confucian Hui Muslim scholar Ma Zhu (1640-1710) served with the southern Ming loyalists against the Qing. Zhu Yu'ai, the Ming Prince Gui was accompanied by Hui refugees when he fled from Huguang to the Burmese border in Yunnan and as a mark of their defiance against the Qing and loyalty to the Ming, they changed their surname to Ming. From 1755–1757, the Qianlong Emperor was at war with the Zunghar Khanate in the northwest. With the conquest of the Dzungaria, there was attempt to divide the Xinjiang region into four sub-khanates under four chiefs who were subordinate to the emperor. Similarly, the Qing made members of was a member of the Ak Taghliq clan of East Turkestan Khojas, rulers in the western Tarim Basin, south of the Tianshan Mountains. In 1758-59, however, rebellions against this arrangement broke out both north and south of the Tian Shan mountains. Then in the oasis of Ush to the south of Lake Balkash in 1765. Professor of Chinese and Central Asian History at Georgetown University, James A. Millward wrote that foreigners often mistakenly think that Ürümqi was originally a Uyghur city and that the Chinese destroyed its Uyghur character and culture, however, Ürümqi was founded as a Chinese city by Han and Hui (Tungans), and it is the Uyghurs who are new to the city. In Gansu, disagreements between the adherents of Khafiya and Jahriya, two forms of Sufism as well as perceived mismanagement, corruption, and anti-Muslim attitudes of the Qing officials resulted in attempted uprisings by Hui and Salar followers of the Jahriya in 1781 and 1784, but they were easily and promptly suppressed, with the help of the Khafiya. Han, Hui, and Dongxiang joined the Salar Jahriyya in the 1781 revolt against the Qing. In the Jahriyya revolt sectarian violence between two suborders of the Naqshbandi Sufis, the Jahriyya Sufi Muslims and their rivals, the Khafiyya Sufi Muslims, led to a Jahriyya Sufi Muslim rebellion which the Qing dynasty in China crushed with the help of the Khafiyya Sufi Muslims. Kashgaria was able to be free of Qing control during an invasion by Jahangir Khoja who had invaded from Kokand, which lasted from 1820–1828. The oases of Kashgar and Yarkand were not recaptured by the Qing until 1828, after a three-year campaign. Hui Muslim merchants helped the Qing fight off Jahangir Khoja and his Turkic Kokandi invaders. In Kashgaria, this was followed by another invasion in 1829 by Mahommed Ali Khan and Yusuf Khoja, the brother of Jahangir. In 1846, a new Khoja revolt in Kashgar under Kath Tora led to his accession to rulership of Kashgar as an authoritarian ruler. His reign, however, was brief, for at the end of seventy-five days, on the approach of the Chinese, he fled back to Kokand amid the jeers of the inhabitants. The last of the Khoja revolts was in 1857 under Wali Khan, a self-indulgent debaucherer, and the murderer of the famous German explorer, Adolf Schlagintweit. Wali Khan had invaded Kashgar from his base in Kokand, capturing Kashgar. Aside from his execution of Adolf Schlagintweit, his cruelty found many other reflections in the local legends. It is said that he killed so many innocent Muslims that four or six minarets were built from the skulls of the victims (kala minara); or that once, when an artisan made a sabre for him, he tested the weapon by cutting off the artisan's son head, who came with his father and was standing nearby, after that with words " it's a really good sabre " he presented artisan with a gift. This reign of tyranny did not make Kashgarians miss the Khoja too much when he was defeated by Qing troops after ruling the city for four months and forced to flee back to Kokand. The local Muslims living under Yaqub Beg's rule in Kashgaria after he took over the area from the Qing, found the conditions under Yaqub Beg to be oppressive and recalled Qing rule favorably and in a positive manner. The Panthay Rebellion lasted from 1855 to 1873. The war took place mostly in the southwestern province of Yunnan. Disagreements between Muslim and non-Muslim tin miners was the spark that lit the tensions that led to war. The Muslims were led by, for the most part of the war, by Du Wenxiu (1823–1872), a Muslim from a family of Han Chinese origin which had converted to Islam. Du Wenxiu raised the banner of his revolt in the name of driving the Manchus out of China and establishing unity between Han and Hui. The insurgents took the city of Dali and declared the new nation of Pingnan Guo, meaning “the Pacified Southern Nation”. The rebellion found support among China's aboriginal population and Burma. The Dungan revolt by the Hui from the provinces of Shaanxi, Gansu, Ningxia and Xinjiang, broke out due to a pricing dispute over bamboo poles which a Han merchant was selling to a Hui. It lasted from 1862 to 1877. The failure of the revolt led to the flight of many Dungan people into Imperial Russia. However, Muslims in other parts of China proper like in the east and southern provinces who did not revolt, were not affected at all by the rebellion, and experienced no genocide, nor did they seek to revolt. It was reported that Muslim villages in Henan province, which was next to Shaanxi, were totally unaffected and relations between Han and Hui continued normally. The Hui Muslim population of Beijing was unaffected by the Muslim rebels during the Dungan revolt. Elisabeth Allès wrote that the relationship between Hui Muslim and Han peoples continued normally in the Henan area, with no ramifications or consequences from the Muslim rebellions of other areas. Allès wrote in the document "Notes on some joking relationships between Hui and Han villages in Henan" published by French Centre for Research on Contemporary China that "The major Muslim revolts in the middle of the nineteenth century which involved the Hui in Shaanxi, Gansu and Yunnan, as well as the Uyghurs in Xinjiang, do not seem to have had any direct effect on this region of the central plain." Many Muslims like Ma Zhan'ao, Ma Anliang, Dong Fuxiang, Ma Qianling, and Ma Julung defected to the Qing dynasty side, and helped the Qing general Zuo Zongtang exterminate the Muslim rebels. These Muslim generals belonged to the Khafiya sect, and they helped Qing massacre Jahariyya rebels. General Zuo moved the Han around Hezhou out of the area and relocated them as a reward for the Muslims there helping Qing kill other Muslim rebels. These pro-Qing Hui warlords rose to power by their fighting against Muslmi rebels. The sons of the defected Muslim warlords of the Dungan Revolt (1862–77) helped the Qing crush the Muslim rebels in the Dungan Revolt (1895–96). In 1895, another Dungan Revolt (1895) broke out, and loyalist Muslims like Dong Fuxiang, Ma Anliang, Ma Guoliang, Ma Fulu, and Ma Fuxiang suppressed and massacred the rebel Muslims led by Ma Dahan, Ma Yonglin, and Ma Wanfu. The 1895 revolt was similar to the 1781 Jahriyya revolt in that it began with fighting between different Muslim factions, and that they had tried to resolve the dispute between the factions through the legal system of China before turning to violence. A Muslim army called the Kansu Braves led by General Dong Fuxiang fought for the Qing dynasty against the foreigners during the Boxer Rebellion. They included well known Generals like Ma Anliang, Ma Fulu, and Ma Fuxiang. In Yunnan the Qing armies only massacred the Muslims who had rebelled, and spared Muslims who took no part in the uprising. In the Qing dynasty, Muslims had many mosques in the large cities, with particularly important ones in Beijing, Xi'an, Hangzhou, Guangzhou, and other places (in addition to those in the western Muslim regions). The architecture typically employed traditional Chinese styles, with Arabic-language inscriptions being the chief distinguishing feature. Many Muslims held government positions, including positions of importance, particularly in the army. The Qing treated Han and Hui civilians in the same legal category. Both Han and Hui were moved from the walled city in Beijing to the outside, while only Bannermen could reside inside the walled city. The origin of Hui in Ürümqi is often indicated by the names of their Mosques. Painting depicting a Chinese Muslim, during the reign of the Qing dynasty. The Qadiriyya, which was established in China through Qi Jingyi (祁静一), also known as Hilal al-Din (1656–1719), student of the famous Central Asian Sufi teachers, Khoja Afaq and Koja Abd Alla. He was known among the Hui Sufis as Qi Daozu (Grand Master Qi). The shrine complex around "great tomb" (Da Gongbei) in Linxia remains the center of the Qadiriyya in China. The Khufiyya: a Naqshbandi order, established in China by Ma Laichi (1681–1766). The Jahriyya: another Naqshbandi menhuan, founded by Ma Mingxin (1719–1781). Chinese Hui Sufis developed a new type of organization called the menhuan, centered around a lineage of Sufi masters. The Hui Muslim scholar Liu Zhi wrote about Sufism in Chinese and translated Sufi writings from their original languages. The Hui Muslim scholar Wang Daiyu used Confucian, Daoist, and Buddhist terminology in his Islamic writings. Liu Zhi and Wang Daiyu were both Gedimu (non-Sufi) Muslims and argued that Muslims could be loyal both to the Mandate of Heaven and Allah, justifying Muslim obedience to the Qing government, since Allah was reflected by the Mandate of Haven in this world. Liu Zhi and Wang Daiyu's writings became part of the Han Kitab, a Chinese Islamic text which synthesized Islam and Confucianism, using Confucian terminology to explain Islam. Liu Zhi met and talked with the Vice Minister of the Board of War regarding Islam, convincing him that Confucian principles were supported by Islam so that it should not be regarded as heretical. Liu Zhi used neo-Confucianism in his Islamic work titled as "The Philosophy of Arabia", and it was written that the book "illuminates" Confucianism, while Confucianism was at odds with Buddhism and Taoism, in a preface to the book by the non-Muslim Vice-Minister of the Board of Propriety. The Chin Haw are a group of Chinese immigrants who arrived in Thailand via Burma or Laos. Most of them were from Yunnan and about a third were Muslim. In the 19th century, Chinese Muslims also became some of the first Muslims in New Zealand (See Islam in New Zealand). They came as golddiggers to work in the Dunstan gold fields in Otago in 1868. Christian missionaries baptizing a 79-year-old Chinese Muslim. (No later than 1908). As the presence of Christian missionaries of various sects increased in China after the Opium Wars, they became interested in converting China's Muslims to Christianity. A significant amount of research was dedicated to the Muslim "problem", as Marshall Broomhall called it, but the effort resulted in no large-scale conversions. Under the "fundamental laws" of China, one section is titled "Wizards, Witches, and all Superstitions, prohibited." The Jiaqing Emperor in 1814 A.D. added a sixth clause in this section with reference to Christianity. It was modified in 1821 and printed in 1826 by the Daoguang Emperor. It sentenced Europeans to death for spreading Christianity among Han Chinese and Manchus (tartars). Christians who would not repent their conversion were sent to Muslim cities in Xinjiang, to be given as slaves to Muslim leaders and beys. ^ Millward, James A. (1998). Beyond the Pass: Economy, Ethnicity, and Empire in Qing Central Asia, 1759-1864 (illustrated ed.). Stanford University Press. p. 298. ISBN 978-0804729338. Retrieved 24 April 2014. ^ Lipman, Jonathan Neaman (1998). Familiar strangers: a history of Muslims in Northwest China. University of Washington Press. p. 53. ISBN 978-0295800554. Retrieved 24 April 2014. ^ Lipman, Jonathan Neaman (1998). Familiar strangers: a history of Muslims in Northwest China. University of Washington Press. p. 54. ISBN 978-0295800554. Retrieved 24 April 2014. ^ Millward, James A. (1998). Beyond the Pass: Economy, Ethnicity, and Empire in Qing Central Asia, 1759-1864 (illustrated ed.). Stanford University Press. p. 171. ISBN 978-0804729338. Retrieved 24 April 2014. ^ Dwyer, Arienne M. (2007). Salar: A Study in Inner Asian Language Contact Processes, Part 1 (illustrated ed.). Otto Harrassowitz Verlag. p. 8. ISBN 978-3447040914. Retrieved 24 April 2014. ^ Lipman, Jonathan Neaman (1998). Familiar strangers: a history of Muslims in Northwest China. University of Washington Press. p. 55. ISBN 978-0295800554. Retrieved 24 April 2014. ^ WAKEMAN JR., FREDERIC (1986). GREAT ENTERPRISE. University of California Press. p. 802. ISBN 978-0520048041. Retrieved 24 April 2014. ^ WAKEMAN JR., FREDERIC (1986). GREAT ENTERPRISE. University of California Press. p. 803. ISBN 978-0520048041. Retrieved 24 April 2014. ^ Brown, Rajeswary Ampalavanar; Pierce, Justin, eds. (2013). Charities in the Non-Western World: The Development and Regulation of Indigenous and Islamic Charities. Routledge. ISBN 978-1317938521. Retrieved 24 April 2014. ^ Michael Dillon (16 December 2013). China's Muslim Hui Community: Migration, Settlement and Sects. Taylor & Francis. pp. 45–. ISBN 978-1-136-80940-8. ^ Millward, James A. (1998). Beyond the Pass: Economy, Ethnicity, and Empire in Qing Central Asia, 1759-1864 (illustrated ed.). Stanford University Press. p. 134. ISBN 978-0804729338. Retrieved 24 April 2014. ^ Dwyer, Arienne M. (2007). Salar: A Study in Inner Asian Language Contact Processes, Part 1 (illustrated ed.). Otto Harrassowitz Verlag. p. 20. ISBN 978-3447040914. Retrieved 24 April 2014. ^ Lipman, Jonathan N. (Jul 1984). "Ethnicity and Politics in Republican China: The Ma Family Warlords of Gansu". Sage Publications, Inc.: 293. JSTOR 189017. ^ Lipman, Jonathan N. (Jul 1984). "Ethnicity and Politics in Republican China: The Ma Family Warlords of Gansu". Sage Publications, Inc.: 294. JSTOR 189017. ^ Dwyer, Arienne M. (2007). Salar: A Study in Inner Asian Language Contact Processes, Part 1 (illustrated ed.). Otto Harrassowitz Verlag. p. 21. ISBN 978-3447040914. Retrieved 24 April 2014. ^ Millward, James A. (1998). Beyond the Pass: Economy, Ethnicity, and Empire in Qing Central Asia, 1759-1864 (illustrated ed.). Stanford University Press. p. 167. ISBN 978-0804729338. Retrieved 24 April 2014. ^ a b Kim, Hodong. Holy War in China: The Muslim Rebellion and State in Chinese Central Asia, 1864-1877. ^ Millward, James A. (1998). Beyond the Pass: Economy, Ethnicity, and Empire in Qing Central Asia, 1759-1864 (illustrated ed.). Stanford University Press. p. 147. ISBN 978-0804729338. Retrieved 24 April 2014. ^ Hugh D. R. Baker (1990). Hong Kong images: people and animals. Hong Kong University Press. p. 55. ISBN 978-962-209-255-6. ^ Lipman, Jonathan N. “Ethnicity and Politics in Republican China: The Ma Family Warlords of Gansu.” Modern China, vol. 10, no. 3, 1984, p. 294. JSTOR, JSTOR, https://www.jstor.org/stable/189017?seq=10#page_scan_tab_contents. ^ Lipman, Jonathan N. “Ethnicity and Politics in Republican China: The Ma Family Warlords of Gansu.” Modern China, vol. 10, no. 3, 1984, p. 298. JSTOR, JSTOR, https://www.jstor.org/stable/189017?seq=14#page_scan_tab_contents. ^ Lipman, Jonathan N. (Jul 1984). "Ethnicity and Politics in Republican China: The Ma Family Warlords of Gansu". Sage Publications, Inc.: 298. JSTOR 189017. ^ Lipman, Jonathan N. (Jul 1984). "Ethnicity and Politics in Republican China: The Ma Family Warlords of Gansu". Sage Publications, Inc.: 299. JSTOR 189017. ^ Michael Dillon (1999). China's Muslim Hui community: migration, settlement and sects. Richmond: Curzon Press. p. 77. ISBN 978-0-7007-1026-3. Retrieved 2010-06-28. ^ Millward, James A. (1998). Beyond the Pass: Economy, Ethnicity, and Empire in Qing Central Asia, 1759-1864 (illustrated ed.). Stanford University Press. p. 132. ISBN 978-0804729338. Retrieved 24 April 2014. ^ Millward, James A. (1998). Beyond the Pass: Economy, Ethnicity, and Empire in Qing Central Asia, 1759-1864 (illustrated ed.). Stanford University Press. p. 169. ISBN 978-0804729338. Retrieved 24 April 2014. ^ Feener, R. Michael, ed. (2004). Islam in World Cultures: Comparative Perspectives (illustrated ed.). ABC-CLIO. p. 165. ISBN 978-1576075166. Retrieved 24 April 2014. ^ Dillon, Michael (2003). Xinjiang: China's Muslim Far Northwest. Durham East Asia Series. Routledge. p. 16. ISBN 978-1134360963. Retrieved 24 April 2014. ^ Dillon, Michael (2004). Xinjiang: China's Muslim Far Northwest. Durham East Asia Series. Taylor & Francis. p. 16. ISBN 978-0203166642. Retrieved 24 April 2014. ^ Gladney, Dru C. (1996). Muslim Chinese: Ethnic Nationalism in the People's Republic. Volume 149 of Harvard East Asian monographs (illustrated ed.). Harvard Univ Asia Center. p. 59. ISBN 978-0674594975. ISSN 0073-0483. Retrieved 24 April 2014. ^ Renard, John (2005). Historical Dictionary of Sufism. Historical Dictionaries of Religions, Philosophies, and Movements Series. Scarecrow Press. p. 104. ISBN 978-0810865402. Retrieved 24 April 2014. ^ Renard, John (2009). The A to Z of Sufism. Volume 44 of The A to Z Guide Series. Scarecrow Press. p. 104. ISBN 978-0810863439. Retrieved 24 April 2014. ^ Lipman, Jonathan Neaman (1998). Familiar strangers: a history of Muslims in Northwest China. University of Washington Press. p. 71. ISBN 978-0295800554. Retrieved 24 April 2014. ^ Dillon, Michael (2003). Xinjiang: China's Muslim Far Northwest. Durham East Asia Series. Routledge. p. 15. ISBN 978-1134360963. Retrieved 24 April 2014. ^ Renard, John (2009). The A to Z of Sufism. Volume 44 of The A to Z Guide Series. Scarecrow Press. p. 146. ISBN 978-0810863439. Retrieved 24 April 2014. ^ Renard, John (2005). Historical Dictionary of Sufism. Historical Dictionaries of Religions, Philosophies, and Movements Series. Scarecrow Press. p. 146. ISBN 978-0810865402. Retrieved 24 April 2014. ^ Murata, Sachiko (2000). Chinese Gleams of Sufi Light: Wang Tai-yu's Great Learning of the Pure and Real and Liu Chih's Displaying the Concealment of the Real Realm. With a New Translation of Jami's Lawa'ih from the Persian by William C. Chittick. Contributor Tu Wei-ming (illustrated ed.). SUNY Press. p. 9. ISBN 978-0791446379. Retrieved 24 April 2014. ^ Masumi, Matsumoto (2004). "The Completion of the Idea of Dual Loyalty Towards China and Islam". Etudes orientales. Archived from the original on 30 April 2011. Retrieved 2010-06-28. ^ Garnaut, Anthony. "Chinese Muslim literature" (PDF). Contemporary China Studies - School of Interdisciplinary Area Studies - University of Oxford. Contemporary China Studies. Archived from the original (PDF) on 1 May 2014. Retrieved 25 July 2014. ^ Murata, Sachiko. Chinese Gleams of Sufi Light (PDF) (illustrated, reprint, annotated ed.). State University of New York Press. p. 25. Archived from the original (PDF) on 2011-06-01. Retrieved 24 April 2014. Kim Hodong, "Holy War in China: The Muslim Rebellion and State in Chinese Central Asia, 1864-1877". Stanford University Press (March 2004). ISBN 0-8047-4884-5. Keim, Jean (1954). Les Musulmans Chinois. France Asie. Ring, Trudy; Salkin, Robert M.; La Boda, Sharon, eds. (1996). International Dictionary of Historic Places: Asia and Oceania. Volume 5 of International Dictionary of Historic Places (illustrated, annotated ed.). Taylor & Francis. ISBN 978-1884964046. Retrieved 24 April 2014. This page was last edited on 10 November 2018, at 14:57 (UTC).